Start off by using a rolling pin and crushing the walnuts into pieces, or you could just blend them. Lay out the filo pastry. Put all the butter into a bowl and microwave it until it is liquid. Make sure to cover up the filo sheets as they dry very quickly and then crack, try to make sure they don't crack. Start off by dipping a brush into the melted butter and 'paint' the bottom of the tray. Put the first layer over the butter in the tray and 'paint' the top of the filo sheet with butter. Do this until you have done 10 filo sheets. Once you have done 10 filo sheets it is time to create the walnut mixture. Pour in a cup of sugar. Put in a teaspoon of cinnamon and mix them together. 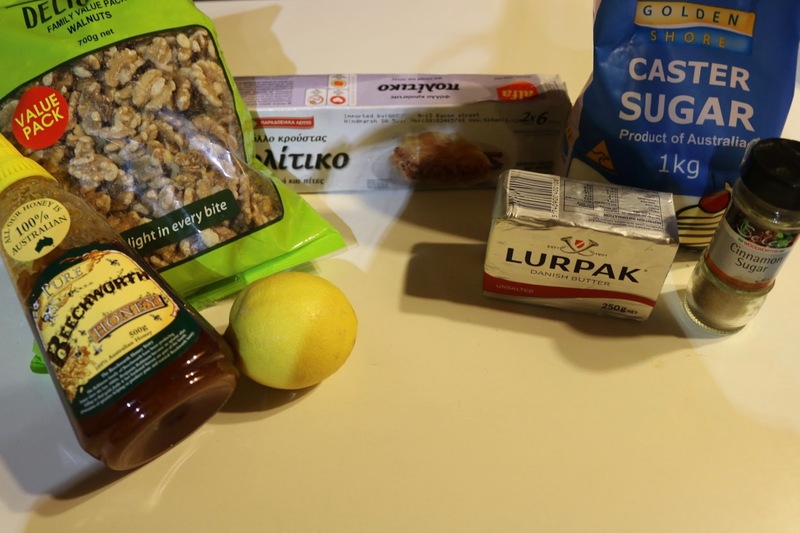 Once you have mixed the walnut mixture together put an even layer of it on top of the first 10 layers of filo sheets (the walnut mixture will be on top of the butter). 10 buttered filo sheets and butter on top. Once you are done cut the pastry all the way down to the bottom of the tray into 1 1/2 wide strips. Then you are going to want to cut all the way down to the bottom diagonally to create nice diamond shapes. Place this in the oven on 150 degrees Celsius on fan bake for an hour and 15 minutes. Whilst it is baking in the oven, grab a sauce pan and combine 1 cup of sugar, half a cup of honey, 2 tablespoons of lemon juice and 3/4 of a cup of water. Put on a medium heat and stir until sugar is dissolved then put onto a low heat and leave for 4 minutes without staring. After 4 minutes take the syrup completely off the heat and let it sit aside cooling whilst the Baklava is baking. Once it is out of the oven pour the syrup on top of the now baked pastry all over the top until there is no more syrup in the sauce pan. Once you have done that, you can eat! But I would recommend you wait and let it sit over night or at least for 4 to 6 hours at room temperature. This turned out gorgeous! I have always been curious about the process to make this. Sounds like definitely takes some time, but your photo play-by-play makes me think I might just have to give it a try. How long do you find it will stay fresh? Haven't had this since middle school home economics. This makes me want to try it again. Yum! I haven't eaten this in years! When I do I only eat 1-2 pieces because it's a very sweet treat but delicious!! They look beyond delicious! I always wondered how these were made...we get them sometimes in Astoria (which has a large Greek community) or out on Coney Island. I'm drooling!! I love love baklava! And I have never made it because it would be so addicting! But I should totally just do it! I do not think I could make this but I would love to. It looks so good I would eat the whole tray. I love your version. I have a friend who makes the pastry. It is a huge process, but oh, my! What a delicious dessert! I sure hope you saved me a bite or two! I'm impressed with the detail and time it takes to bake this! What a process - but so worth it! This is a well-written recipe. I really like your picture and direction flow. This is one of my favorite desserts. If I could eat it every day, I would! I'm definitely going to try making this one day now that you've shared how to make it! It looks sooo delicious. I love a good baklava. I've never tried to make it myself but I'm excited to try out this recipe for myself at home. I have never tried making baklava before. However, after seeing this I will definitely have to give this a try!! My husband worked in a Greek restaurant and loved their baklava. I would love to make this for him as a surprise. He would love it! YES to this recipe! It looks so good and you make it seem easy. I love baklava but I've never had the chance to make, I find the recipe a little intimidating. I think this one's a must try though. I've never thought to make baklava before but this looks so amazing, I think I'll have to give this recipe a try! Wow I have never had this before, let alone make it!!! It looks like a delicious dessert for Greek Easter! I have never tried baklava before but your recipe looks amazing! My BIL is greek, I'm sure he's made this before and loves it.